Catskills comedians Schumer, left, and Vance, right. It can’t be easy being an elected official in New York. Day in, day out, our politicians are subjected to both the mind-numbing tedium of governmental bureaucracy and the anxiety associated with running a huge, messed-up city. 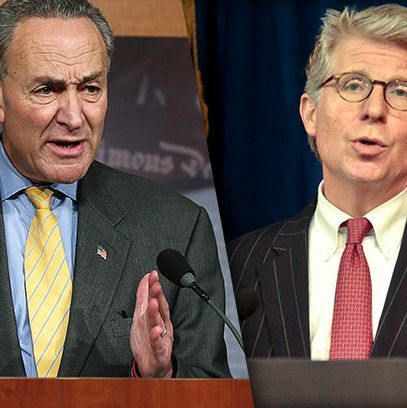 Which may be why, in times of trouble, two of the city’s preeminent political figures – Manhattan district attorney Cyrus Vance Jr. and Senator Chuck Schumer – have turned to Catskills-level wordplay. This week was big on the yuk-yuk front. D.A. Vance had the once-in-a-career chance to announce he had busted a guy who allegedly stole a Salvador Dalí painting from a gallery on the Upper East Side (“It was almost surreal how this theft was committed,” he said), and Schumer went on a legendary, pun-filled riff about an illegal Chinese honey-smuggling ring. Sen. Schumer has no such excuse, and is just an irrepressible cornball.